​​​ ​SOUTHLAKE – The City Council gave the green light to a zoning change and development plan for a residential community called Metairie, located at 500 and 550 W. SH 114. 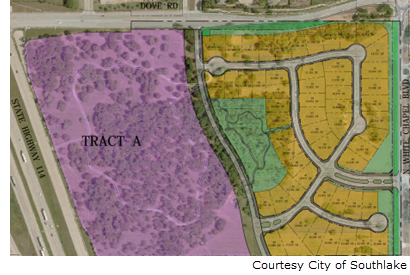 Metairie includes 56 residential lots and three open space lots of about 29 acres. Lot prices would begin at $350,000 and the homes would begin selling at $950,000. The open spaces will include sidewalks and trails.